Our range of products include althrocin antibacterial drop, ciprofloxacin drop, candid ear drop and chloramphenicol palmitate drop. Usage/Application Althrocin 100 mg Drop is an antibiotic. HOW TO USE ALTHROCIN DROPTake this medicine in the dose and duration as advised by your doctor. Check the label for directions before use. Measure it with a marked dropper and take it as directed. Althrocin 100 mg Drop is to be taken empty stomach.HOW ALTHROCIN DROP WORKSAlthrocin 100 mg Drop is an antibiotic. It works by preventing synthesis of essential proteins required by bacteria to carry out vital functions. 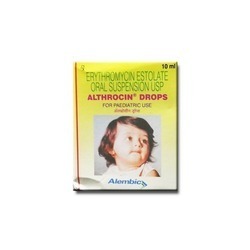 Thus, it stops the bacteria from growing, and prevents the infection from spreading.ALTHROCIN DROP RELATED WARNINGSAlcoholCAUTIONTaking Erthromycin with alcohol may cause minor drug interactions which may not be clinically relevant in all patients.PregnancyPROBABLY SAFEAlthrocin 100 mg Drop is probably safe to use during pregnancy. Animal studies have shown low or no adverse effect on the foetus, however, there are limited human studies. Please consult your doctor.LactationSAFEAlthrocin 100 mg Drop is safe to use during lactation. Human studies have shown that either the drug does not pass into the breastmilk in significant amount or is not expected to cause toxicity to the baby. There may be a possibility of diarrhea or rash in the baby.DrivingSAFEAlthrocin 100 mg Drop does not usually affect your ability to drive.KidneySAFEAlthrocin 100 mg Drop is safe to use in patients with kidney disease. No dose adjustment of Althrocin 100 mg Drop is recommended. However, inform your doctor if you have any kidney disease as the use of this medicine may affect hearing in patients with severe kidney disease.LiverCAUTIONAlthrocin 100 mg Drop should be used with caution in patients with liver disease. Dose adjustment of Althrocin 100 mg Drop may be needed. Please consult your doctor. Use of this medicine in liver disease patients can cause hearing loss.WHAT IF YOU MISS A DOSE OF ALTHROCIN DROP?If you miss a dose of Althrocin 100 mg Drop, take it as soon as possible. However, if it is almost time for your next dose, skip the missed dose and go back to your regular schedule. Do not double the dose. Ciplox D Eye/Ear Drops is used in the treatment of eye infection with inflammation. Ciplox D Eye/Ear Drops is a combination of two medicines: Ciprofloxacin and Dexamethasone. Ciprofloxacin is an antibiotic. It kills bacteria in the eye/ear by preventing them from reproducing and repairing themselves. This treats your infection. Dexamethasone is a steroid which blocks the production of certain chemical messengers (prostaglandins) that make the eye/ear red swollen and itchy. Ciplox D Eye/Ear Drops may be unsafe to use during pregnancy. Lactation Ciplox D Eye/Ear Drops is probably safe to use during lactation. Limited human data suggest that the drug does not represent a significant risk to the baby. Driving Do did not drive unless you are feeling well. Ciplox D Eye/Ear Drops may cause dizziness (vertigo). Changes in your eyesight or muscle weakness may also happen. This may affect your driving ability. Candid ear drop is used in the treatment of fungal infections. Candid ear drop side effects common. Candid Ear Drop Is A Combination Of Two Medicines: Lidocaine / Lignocaine And Clotrimazole, Which Treats Ear Infections. Lidocaine / Lignocaine Is A Local Anesthetic Which Works By Blocking Pain Signals From The Nerves To Brain, Thereby Decreasing Pain Sensation In The Ear. Clotrimazole Is An Antifungal Which Stops The Growth Of Fungi In The Ear By Preventing Them From Forming Their Own Protective Covering. Renicol Eye Drop is used in the treatment of bacterial eye infections. Renicol Eye Drop is an antibiotic which stops the growth of bacteria that cause eye infections. It does so by preventing synthesis of essential proteins required by bacteria to carry out vital functions. This does not directly kill the bacteria, but prevents them from increasing in numbers, and eventually clears up the eye infection. Pregnancy weighs risks vs benefits Renicol Eye Drop may be unsafe to use during pregnancy. Lactation Caution Renicol Eye Drop is probably unsafe to use during lactation. Limited human data suggest that the drug could represent a significant risk to the baby. 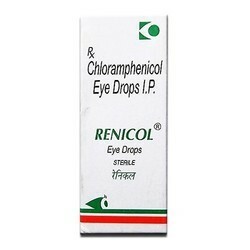 Driving Renicol Eye Drop may cause blurring of your vision for a short time just after its use. Do not drive until your vision is clear.